The ideologues of business have started a systematic and sustained campaign against the wages and the laws that protect workers. The job crisis is central to their campaign and deregulation is their leading mantra. Opinion pieces, columnists and letters in the business press appear as voices of the same choir conducted by a single mindedness to attack the alleged rigidities of the labour market and other regulations that undermine so-called economic freedom. So sustained seems this attack that Business Day of 13 June has Michael Bagraim of the Cape Chamber of Industries writing an op-ed piece, ‘Why Vavi’s socialist jobs ideas are bound to fail’, on one page and a letter on the opposite page titled ‘Unions creating fear’. The background for this is the debate concerning the direction of economic policy. Recently government published the Industrial Policy Action Plan, The New Growth Path Document and now Trevor Manuel’s National Planning Commission has published its Diagnostic Overview. A common thread running through these texts is SA’s unemployment crisis and strategies for creating jobs. This seems to be the opening for the corporate ideologues to unashamedly promote a set of failed policies, namely deregulation and liberalisation. The very set of policies that are widely understood to be the cause of the Great Recession and the long crisis gripping the global economy. Years of economic deregulation, liberalisation, privatisation, lower taxes and profits at the expense of wages – policies which we know collectively as neoliberalism – resulted in a massive redistribution of wealth from the poor to the rich. The concentration of wealth and the global rise of inequality put an end to the post–Second World War dynamic of economic growth driven by the expansion of consumption of millions of workers based on expanding wage employment. Neoliberalism has not only led to wider levels of inequality but to an almost constant situation of overproduction and stagnant markets. In an attempt to overcome this crisis, the ruling class elite made things even worse through switching from production to financial speculation. A new phase of financial turmoil in the global economy resulted as speculative bubbles ballooned and then went bust. And Greece is just the latest example of this. In this period of economic crisis the powerful elites seek to pass the costs of the crisis on to working and poor people. Hence, the unemployment crisis is not seen as a result of wave after wave of corporate restructuring where millions of workers were expelled from the workplace as businesses tried to maximise profits in a situation of declining demand and intensified competition. Rather, supposedly high wages and remaining regulations that protect workers are opportunistically trundled out by the captains of industry as the cause of unemployment. 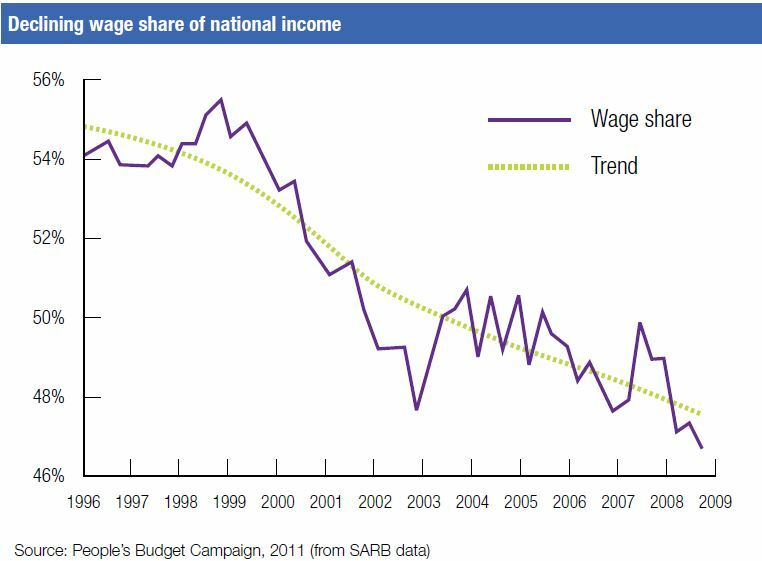 As shown by official GDP statistics, ever since the end of apartheid, profit share of national income has increased over the wage share. See diagram below. Yet the ideological onslaught continues unabated. Mike Schussler of economists.co.za attacks the demand of public sector workers for a wage increase of 9%, claiming that public sector workers earn the equivalent of their Swedish and French counterparts. Yet, as the diagnostic overview report of the NPC states, a third of all employed people earn less than R1 000 and half of all employed people earn less than R2 500. The same NPC report points out that many working families in SA experience grave poverty because of the high number of dependents that share in the wage of the ‘lucky’ few that have employment. Cosatu has consistently pointed out that the wage of a single worker supports as many as ten dependents without income: ‘because many low-wage earners have to support so many people, many working households live near or below the poverty line’ (NPC, Diagnostic Report, p. 11). The same ideologues who attack wages as the cause of high unemployment have nothing to say about the high profits and income of the very wealthy. According to Statistics South Africa the richest 10% of households have more than 56% of the total income from salaries and wages. Each of the top 20 paid directors in JSE-listed companies earned 1 728 times the average income of a South African worker in 2008. The CEO of Edgars is reported to earn R755 million. This is the equivalent of 25 000 workers earning R2 500 per month. Take into account the steady decline in wage share of national income down from 56% in 1996 to less than 47%, and the reason for a combined struggle of the labour and social movements for decent work and a living wage becomes obvious. Last year, Cosatu general secretary Zwelinzima Vavi promised ‘the mother of all living wage campaigns’. To counter the offensive from big business, now and in the future, such a campaign should be rolled out as soon as possible. Since unemployment and job losses are such deep crises in our society, the labour movement would do well to build a common struggle with key social movements in fighting not just for a living wage but decent work for all. ‹ Getting the energy mix right – towards a publicly driven, socially owned renewable energy sector!